On Sunday I conducted a major wardrobe purge. Every garment of mine was hastily inspected and tossed into one of three piles: Keep, Sell, or Donate. The "sell' items are those that are still in good condition, fashionable, and/or have a nice label (including my favorite line, "Christina Sonja") for which I can hopefully get some cash at a local consignment shop. 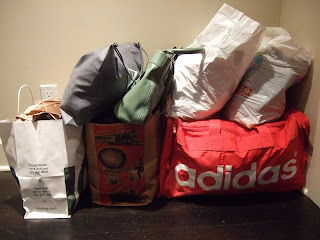 "Donate" items will end up in a Seattle thrift store. The garments that made the cut were re-admitted to my closet, and I also installed a new over-the-door shoe organizer that I got for Christmas. What a treat it is to not have to get on my hands and knees, groping in the dark corners of my closet floor to find my shoes! Oh, it's such a great feeling to clean out the closet! I need to do this soon. 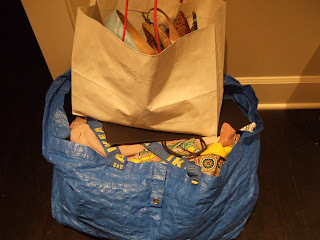 I love those Ikea bags! So useful! And yes, I cleaned my closet over the holidays. Feels so good! Although I could use a second pass. I feel like there are still things I can do without. Purging the closet is almost as synonymous with starting a new as getting a fresh new hair cut. That being said, I'm horrible at it. I always can't let go of things I really will never wear again. p.s. How awesome would it be to be walking around and see someone wearing a Christina Sonja orginal??? It's very therapeutic....what a great feeling .Especially when more than half of our wardrobe hasn't seen the light of day in years. Why hold on? I find that once it has left the house , you don't think about it anymore....but agree it doesn't last for long. Just think of all the room you've made to hang more "Christina Sonja" originals! Oh cleaning out the closet is a good feeling! Hope some $$ coming rolling in for the consignment stuff! I LOVE cleaning out my closet. I love cleaning in general! It's such a great feeling!